Do Courtroom Delays in the Bronx Come at a Cost to the City? Suspects arrested on criminal charges who cannot make bail or are denied bail are detained in city jails while their cases are being decided. If the arrestee is convicted and sentenced to time in state prison, the period of time already spent in city jails is deducted from their sentence. Time spent in city jails comes at the city’s expense, time in state prison at the state’s expense. Therefore, the longer it takes to convict, the more it costs the city in detention spending that would otherwise be paid by the state. 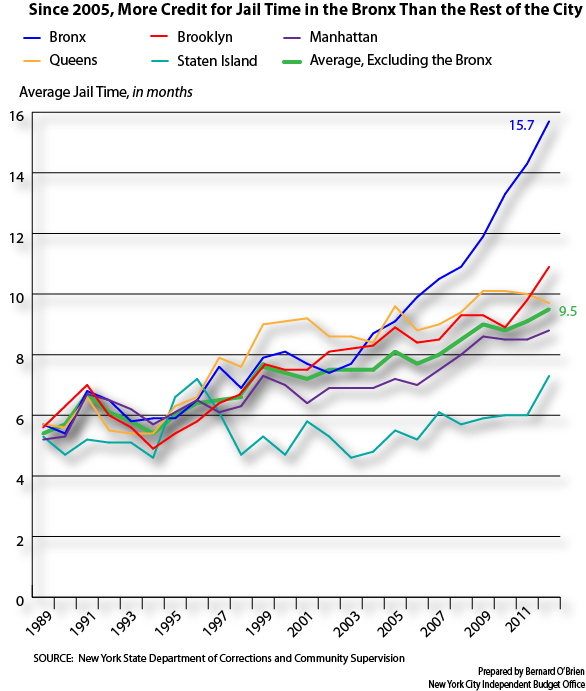 The average time in city jails credited to inmates newly sentenced to state prisons from Bronx courtrooms grew to 15.7 months in 2012, about six months more than the average in the remainder of the city. If the average in the Bronx had been the same as that in the rest of the city, New York City would have saved about $14 million last year on jail expenditures. 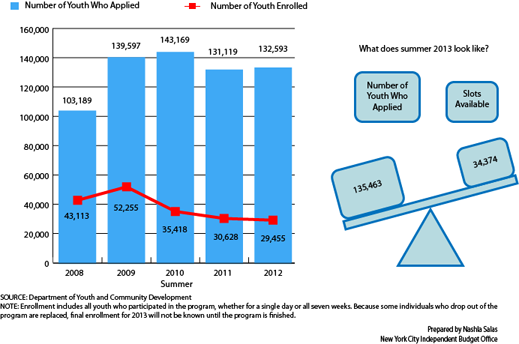 Will More Youth Get Jobs in the City’s Summer Jobs Program This Year Than in Recent Summers? The demand for summer youth jobs has always exceeded the number of jobs provided by the city, and over each of the past three summers more than 100,000 youth who applied for the program were turned away. Budget pressures at the state and city level have played a role, as well as increases in the minimum wage and programmatic changes. For 2013, some additional federal money along with new private funds has increased the number of slots available, which is likely to translate into an increase in enrollment.